-SG- George Tucker needs little introduction to those interested in twenties Norton racing activities. 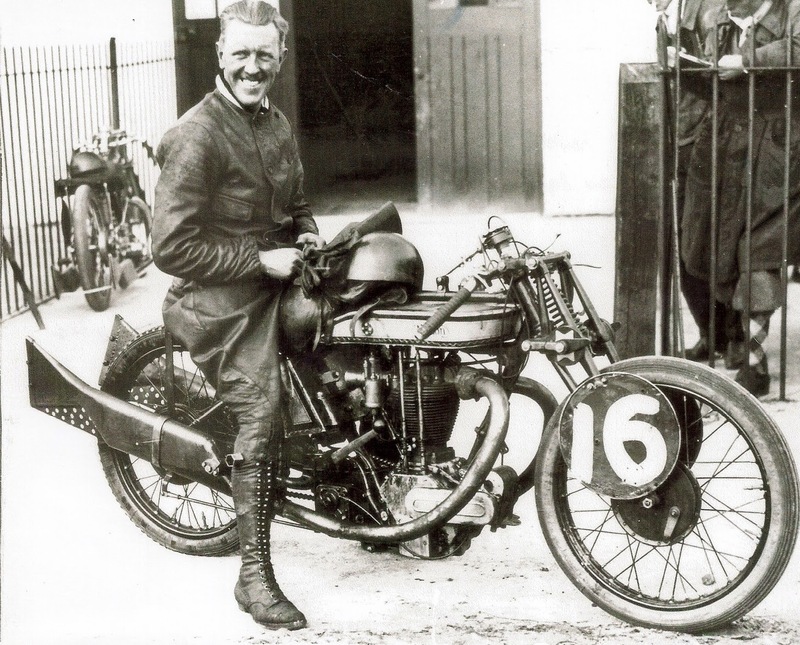 A personal friend of J. L. Norton, Tucker had a motorcycle business in Bristol and competed successfully in the sidecar TTs of 1923 (3rd) and 1924 (1st) although he retired in the 1925 event. His two solo outings to the IOM were altogether less remarkable. He was also a Brooklands regular, both solo and sidecar, and the photo above has been re-produced many times over the years. The dry-sump flat tanker on which he is mounted had just been used to win a three lap handicap event at Brooklands in April 1928. The race report states that it is of 490cc but as the barrel is clearly of '588' size, he may have been using one of the special 8 1/2" con rods used by the Norton team at the track at the time, in the 490cc engines. It will be noted that the bike has a twin exhaust system coming from an adaptor on the cylinder head. Without going into the merits or otherwise of this arrangement from the performance point of view, the adaptor was Tucker's own idea and it was publicised in the Motor Cycle on 10th March 1927. Roger has kindly provided the scan giving details. How many of these kits were sold I don't know but I would think not that many. One of the adaptors was in Murray's Motorcycle Museum in the IOM but following the dispersal of much of the contents, I am not sure where it is now. But another, a bit battered, has turned up in New Zealand of all places and Artie has provided photos of it for the site. It will of course only fit twenties heads with the straight ahead exhaust ports.